Attorney General Eric Holder announced that he was resigning from the Justice Department in September 2014. Six months later, he was still working at the Justice Department, as the Senate stalled on confirming his proposed replacement, Loretta Lynch. The longer Holder waited, the more people in Washington you could find wearing black rubber wristbands that said “Free Eric Holder” on them. 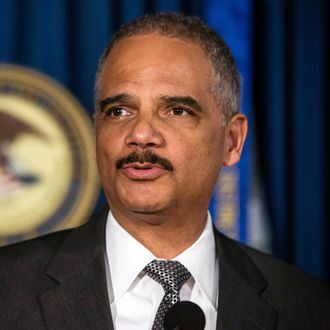 One Justice Department employee told The Wall Street Journal, “We’re hoping for a day we don’t have to wear these bracelets anymore, even if it takes a charity album.” By late March, they were thinking of upgrading to “Free Eric Holder” T-shirts. However, the Senate finally confirmed Lynch, and she will get sworn in on Monday. Next week, Eric Holder finally gets to leave. He gave a good-bye speech on Friday afternoon, addressing the Justice Department employees he has worked with for more than six years. Near the end of his remarks, he took “Free Eric Holder” wristbands off his arm and threw them at his audience. “I think we can officially say now that Eric Holder is free,” he said. Holder takes off his "Free Eric Holder" wrist bands and flings them into the crowd. Was Loretta Lynch there to catch one?